World champion siblings ABE Uta and ABE Hifumi (both of Japan) took gold and silver on day one of the Osaka Grand Slam as the box office duo were the headline attraction in their homeland. 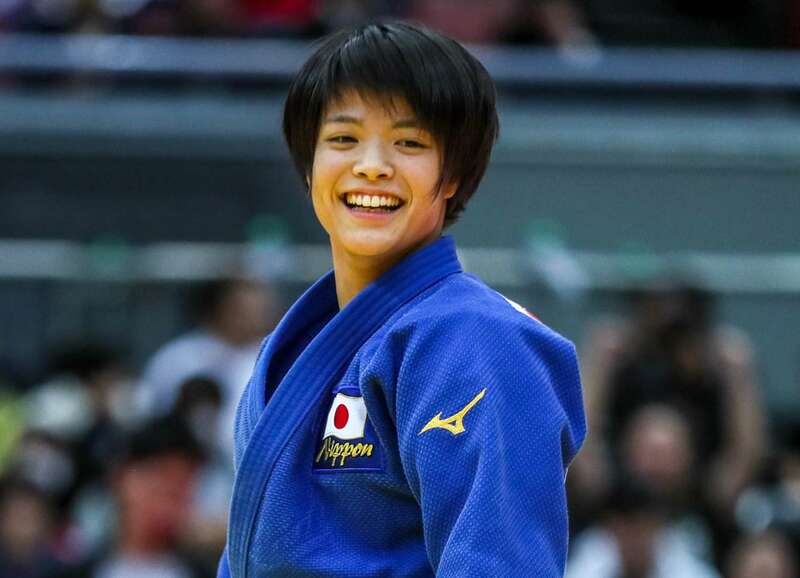 Japan’s 18-year-old sensation ABE Uta remained undefeated since 2016 with a hard-fought win over TSUNODA Natsumi (JPN) in an all-Japanese final. Older brother ABE Hifumi, who attracted the loudest reaction from the plentiful crowd on Friday, overshadowed Paris Grand Slam silver medallist MARUYAMA Joshiro (JPN) to suggest that the former might not necessarily have his Tokyo 2020 spot booked up quite yet. The ABE family were on the song on the preliminaries and Uta worked hard to overcome a stubborn TSUNODA in her final while HIFUMI could not break the resistance of MARUYAMA who absorbed everything the reigning world champion had to offer and then did what many thought was inconceivable at the start of the day. Where the Japanese superstars go from here is not decided with them likely to sit out the World Judo Masters but judo fans will be checking every inscription and looking for their names first in the coming months. Rio 2016 Olympian Esther STAM, who is in Osaka as part of the IJF broadcast team, observed all the action and shared her expert opinion on the lively start to the final Grand Slam of the year. It is a well-known fact that any visit to Japan is going to be an uphill task. Japan, having so much depth and being able to enter four judoka per weight category, is the clear favourite to top the medal rankings. Unlike the other tournaments on the IJF World Tour, athletes know in advance that they will have to take out not one strong Japanese, but maybe two, three or four in one day. That having been said, the Japanese still managed to impress me. They won all four categories today and in a convincing fashion. You hardly saw them making any mistakes. Most of the contests they did lose were on penalties and often against their fellow teammates. Day one saw the Japanese team take four gold, two silver and four bronze medals, demonstrating that Japan is building their team to host next year’s World Championships and the Olympic Games in 2020. Of course, there is the added problem of athletes being well-known to one another, and not just Japanese v Japanese. Some judoka compete on the IJF World Tour on a regular basis and they know each other really well. This can often result in a lot of tactical judo, and we saw some of that today. There was further confirmation (if any was needed) of how important kumi-kata is nowadays. Often the one able to get his or her own grip, was the one being able to dominate the contest and scoring waza-ari or ippon. A good example was KIM Won Jin (KOR) who was able to dominate the grips against TAKATO Naohisa (JPN), taking out the world champion in the second round. Despite ending on three shidos, it was a tight and absorbing contest that kept you on the edge of your seat. The big exception with kumi-kata for me were the two Russians, both of whom medalled today. Yago ABULADZE and Aram GRIGORYAN showed that their methods for controlling grips could also lead to being very dangerous. The style from both judoka is quite unorthodox and yet one sees that their opponents were struggling with that. We saw great work from both of them being able to find a solution for the Asian dominance here in Osaka. Esther STAM, a long-time international judoka for the Netherlands, won Grand Prix medals, a European Championships silver medal and fought at the Rio 2016 Olympics for Georgia. STAM commentated at the World Judo Championships 2018 in Baku and the IBSA World Judo Championships in Portugal. 24. Sep. 2018 / Since five days, I am happy.